To work as an art auctioneer, you will need to become both a specialist in fine art and a savvy business-person. As an art connoisseur, it is mandatory to have a passion in art as this is something that cannot be faked. In other words, you must love handling aesthetic objects like ceramics and paintings and be able to evaluate them in the art marketplace. There are several ways to become an auctioneer: 1. It's your family's business; 2. Attend auction school; and 3. apprenticeship. Here are ten steps to take to get started in your art auction house career. Becoming an expert in your field is the key to success. Many successful people only had a high school education; however, in today’s competitive job market, a college degree is necessary. And to become a high-level art expert, a graduate and even a doctorate degree in your area of specialization required. To work in the field of art auctions, a degree in art history is the first step. Many people working in art auction houses will also be art appraisers who are certified by professional arts organizations. Auctioneer Douglas Bilodeau says "Go to auction school!!!" At auction school, students learn how to do proper bid calling and improve their public speaking techniques and presentation. Auction schools teach students on how to work the various auctions such as government, bankruptcy, consignment, and estate auctions and how to work in auction houses. Auction schools also teach marketing, business and appraisal skills, plus how to deal with ethical, legal, and tax issues. The preview is when visitors can examine and sometimes handle the artworks that are slated for auction. The art auction house staff is on hand to discuss the condition, provenance, value, and rarity of the artworks. When an auction begins, visitors are seated and the artworks are no longer available for individual inspection. The auctioneers auction works by lot, in numerical order as they are listed in the catalog. Besides majoring in art, learn the business side by apprenticing in an auction house. Art appraising is a vital skill to have to work in an auction house. St. Louis-based certified fine art appraiser Mary Carpenter advises, "to become a Fine Art appraiser, I would first obtain a degree in Art History. I would then work in a gallery or at an auction house in order to understand the market side of the business first-hand. If you can have experience with conservation as well, that is useful in assessing the impact condition has on objects." Fine arts auction house expert Katherine Boyle of Bonhams also recommends the importance of auction house work experience and she provides advice on how to advance your career in art auction houses. In these fast-paced times, spending time reading and contemplating is often overlooked. However, if you want to succeed in your art auction house career, then you must become an expert with a specialization. Being such an art expert requires having a wealth of information about art and aesthetics, so reading about these topics is an absolute necessity. "Engage specialists in conversation, and ask questions about the market." Auction previews, art, and antique fairs and art galleries are the perfect places to speak with art experts and to further develop your art market knowledge. "Review catalogs." Museums, art galleries, and auction houses produce high-quality catalogs which provide detailed information about artworks such as its provenance and rarity. Many museum libraries will carry art catalogs. "Pick an area of interest and develop deep expertise." 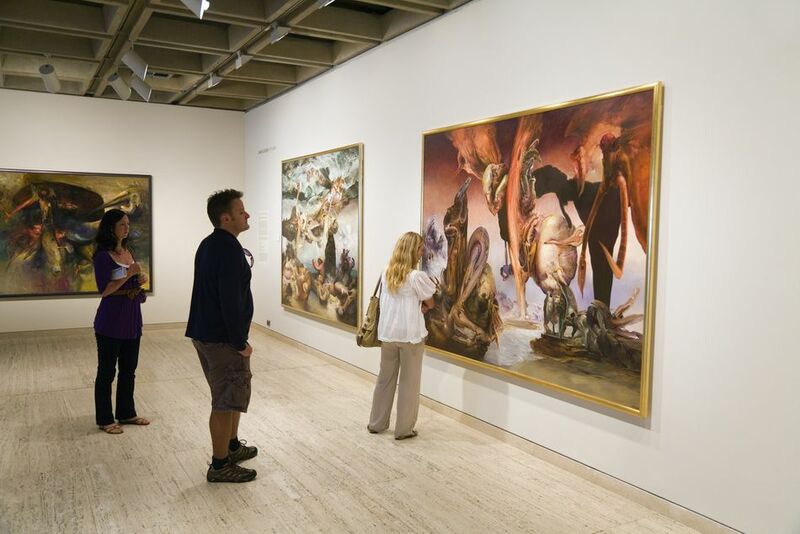 Check the various departments of an art museum or an art auction house to help determine which area to specialize in. As in any field, working hard is the surest way to become professionally successful and to climb that proverbial ladder. Being employed in an art auction house requires staff members to work hard and to work collaboratively as there are constant deadlines and exacting details to focus on. Jim Halperin of Heritage Auctions says "Auctions are a team effort - be flexible and prepared to pitch in during any crunch or deadline. At HA, getting a foot in the door, along with hard work and a willingness to learn, can lead to opportunities and growth." In order to succeed in the field of art auctions, you must be active in the arts. Attending arts events are mandatory. To work successfully as an art auctioneer, it is imperative to be active in the arts by attending art exhibitions at museums and art galleries and to attend art lectures and other professional events geared for arts professionals. Jim Halperin of Heritage Auctions says “Attend lectures, galleries, and museum shows.” Attending such events not only helps you stay aware of current art and art market trends​ but is a wonderful way to network with like-minded people and other art experts. Some countries and some American states require art auctioneers to be licensed in order to work as auctioneers. Licensing varies from country to country, and even state by state in the US. Not all states in America require auctioneer licenses. So check with the local auctioneers or auction houses and state authorities about their licensing requirements. Ethics are extremely important when it comes to art appraisals and art auctions as success in these fields rely upon maintaining an impeccable reputation. Since a large part of the art trade is unregulated, reputation is key and auctioneers must maintain a good reputation in order to be successful in their careers at art auction houses. Jim Halperin of Heritage Auctions says, "A good auction house is a labor-intensive, knowledge-based, low-margin, high-overhead, very cyclical business. Retain lawyers, accountants, and marketing consultants; learn a specialty cold; and be prepared to work very, very hard, with eyes firmly fixed on the long-term horizon: In this business, reputation is everything."